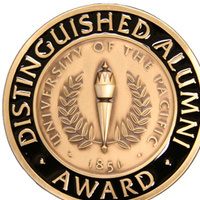 The Pacific Alumni Association will recognize five alumni at this special milestone annual Distinguished Alumni Awards Dinner on Jan. 26 at the River Mill. The Distinguished Alumni Awards recognize alumni whose outstanding achievements and services to humanity have brought credit to University of the Pacific. José Moreno Hernández '84, who will receive the Medallion of Excellence. Steven J. Goulart '80, who will receive the Distinguished Professional Service Award. The event begins with a reception at 6 p.m. and dinner at 7 p.m. Tickets are $75 per person and reservations are required. Call the Alumni Relations Office at 209.946.2391 or toll-free 866.575.7229 to reserve tickets. Please reserve your tickets by Jan. 14.